Beginner	 Has little or no weaving experience with the materials being used for that project. If you are an intermediate reed weaver but have never worked with pine needles before then consider yourself a beginner for a pine needle class. Intermediate	 Skilled at basic techniques with materials being used. Advanced	 Has mastered all the basic skills and is ready to try new techniques, fibers, shaping and creative methods. It is suggested that you bring your own weaving tools like scissors, awls, pencils, towel, water bucket, and measuring tape. Some teachers will have an additional tool list in the brochure class listing. This little cup basket has a glass liner from Yoplait “Oui” French style yogurt. 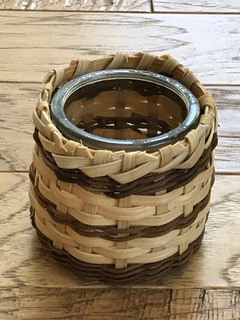 It is woven with natural and smoked reed. It is a quick weave and a great little gift item. You will make one bowl in class with material to make another bowl at home. 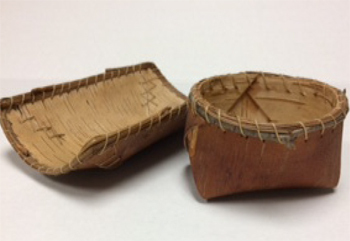 You will learn how to cut, fold, and shape from a rigid sheet of birch bark. Then you add pine needles or a tree branch for rims with waxed linen lashing. This is a nice birch bark set to display. 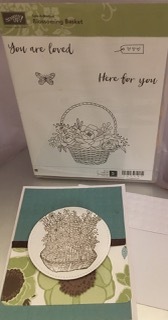 You will create two hand stamped basket themed cards. Using embossing folders, dies to cut out your images and other techniques you will learn to make your cards special. You will also create a magnetic bookmark with a basket image. 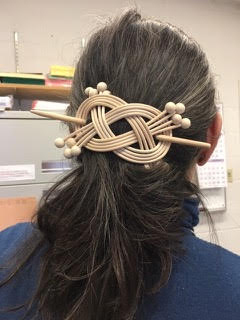 A quick, easy and versatile weave that can be made into a barrette (as shown) or used as a scarf clasp. A pin back would turn this cute piece into a lapel accessory. Another painter Paper Tray, this one reminiscent of a classic quilt pattern, the Nine Patch. 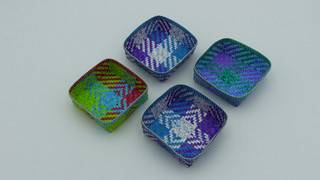 Using 1/8” wide paper strips in four colors, weave the nine patch with a diamond pattern or a 2/2 twill pattern. The tray sides continue the pattern. Pattern includes both twill options and teacher will provide a wide choice of paper, painted and precut. Tools: Students should bring a #26 tapestry needle, sharp scissors, several toothless alligator clips and a small bent tip packer. 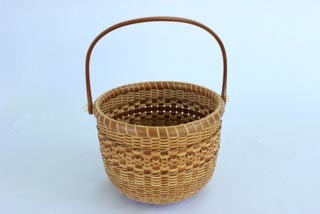 This elegant and useful basket will be an enjoyable weaving project for both beginners and intermediate weavers. It has a hardwood base into which students will insert rattan spokes. 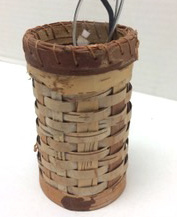 The mold, which insures a uniform shape for your basket, is a plastic wastebasket and will remain inside when you are finished weaving. 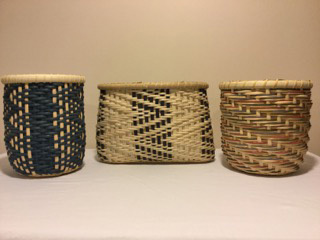 Discussion will include dyeing techniques, creating a “zig-zag” and how to “work out the numbers” for continuously woven twill baskets. Based on the number of spokes of your individual basket, students will choose a twill pattern to weave on the side of their basket. The basket will be finished off with sturdy rims and lashing. 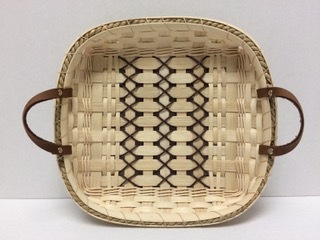 This basket is perfect for a beginner or one who would like to brush up on Nantucket basket weaving techniques. You will weave on a class mold beginning by inserting tapered cane staves into a cherry base. 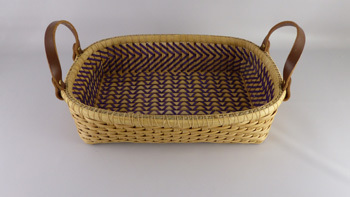 The basket can be woven in a traditional style or in a twill pattern. A cherry rim and handle with bone domes complete the basket. This native American-style basket is indigenous to the northeast woodlands. Its rectangular bottom and circular top will be sewn with spruce roots and rimmed with red willow. We’ll split roots, branch, and make various stitchings. 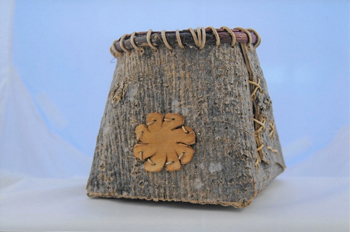 The flower applique is white pine bark stitched with spruce root. There will be many choices of applique designs. All materials are wild harvested by teacher with every bark piece unique. 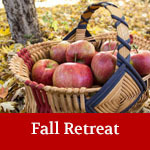 The Large Apple is a perennial favorite traditional Ozark-style working basket. It is made from white oak trees I select, cut, and prepare by hand, using homemade tools my dad made and used. It has a woven oak working bottom and solid oak handle. I will share all things concerning making a white oak tree into a beautiful basket. It will be woven on a mold and everyone should finish in class. 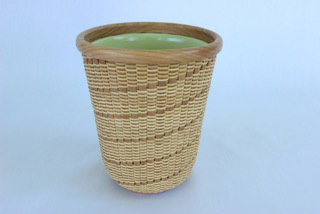 A perfect basket for the basket maker who embraces the Shaker cheese challenge. I have a unique way of teaching the Shaker cheese technique that is readily understandable. 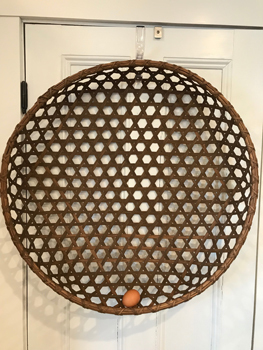 This stunning large Shaker cheese basket makes a real statement hanging on a large open wall. Learn the joy of weaving with hand harvested and prepared red cedar from Thorne Bay, Alaska! With this basket you will learn diagonal plaiting and a unique three-dimensional border. Materials provided make two—you may finish both in class time or take a kit home to reinforce what you learned! You will learn to make cordage from daylily leaves and then use the cordage as a weaving element in your basket. The variegated browns of the daylily cordage is pleasing to the eye in this simple basket. You will never throw your daylily leaves into your compost again! 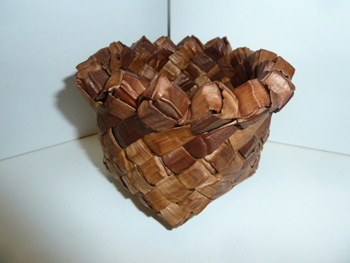 The basket is woven over a class mold that starts with a cherry base where I have inserted pre-tapered cherry staves. You will chase weave and focus on the center design, using round reed, 4-mm cane, a cherry strip, and fine cane. The basket is completed with a two-piece cherry rim, cherry handle, bone knobs, and ivory plugs. I have pre-finished the handle and base with polyurethane. 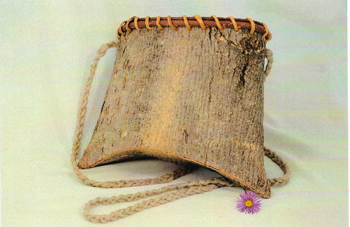 This world-wide indigenous container is the original trailside harvesting bucket. Clean and prepare spruce roots for stitching, split a red willow branch to make an inner and outer rim. Braid a hemp cord strap to finish this strong and attractive day pack. I will wild harvest all materials except the hemp cord. Each bark is unique. You will use a ceramic pot for the mold that will remain in your finished container. The container begins with a cherry base where I have inserted cherry staves. Woven with cane, you will learn to weave three twills in your design. The container is finished with a one-piece cherry rim. Rim and base are pre-finished. A nice little tray that you will want to display when not using. This double wall basket features lattice work and a continuous twill weave. Consistency in tension and shaping will be emphasized in class. You will have several color choices. Basket will need to be completed on your own. All instructions will be provided. 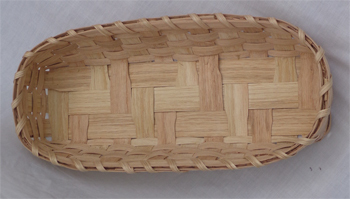 This graceful reed basket has a weaving challenge of going outward then changing to a smooth inward shape in a short tight distance. Learn how to weave up exactly to fit the hoop which holds your beautiful lid. 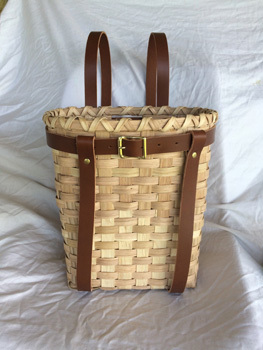 The Ozark White Oak Back Pack is the newest and most popular basket I teach. It is made from white oak trees I select, cut, and prepare by hand, using homemade tools my dad made and used. It has a woven oak herringbone bottom, double lashed and is finished with a beautiful leather harness. It will be woven on a mold and everyone should finish in class. I will share all things concerning making a white oak tree into a beautiful basket. 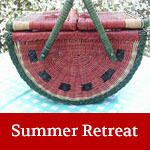 In this class you will weave a unique basket of your very own creation! The design will be your own and the shape will be your own. 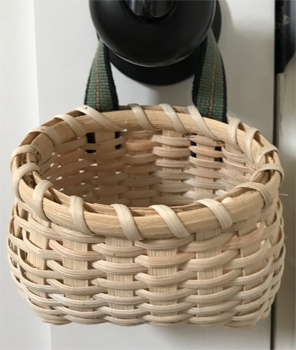 You will learn the mathematics of creating a basic twill pattern and then weaving that pattern into a basket on either a 5” round or 2” x 9” oval wooden base. 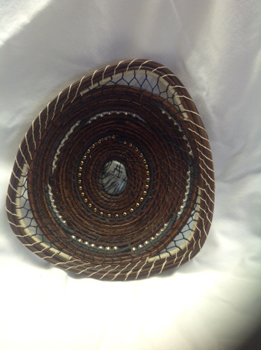 This class will focus on the process, empowering you to be creative and explore how changing one or two elements in the set up and weaving pattern of a basket dramatically alters it. There will be natural spokes and weavers available, as well as two additional complementary colors. 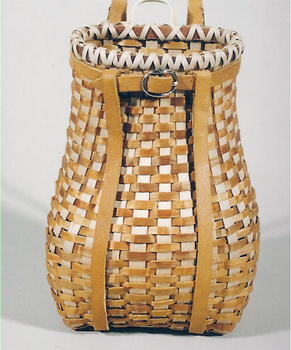 The Seagrass Tote Basket is a reproduction of an antique native American basket. The sides of the basket have great textural interest. Varied sizes of flat oval weavers and seagrass techniques create the textural interest. Shake tape handles complete this functional yet interesting basket. 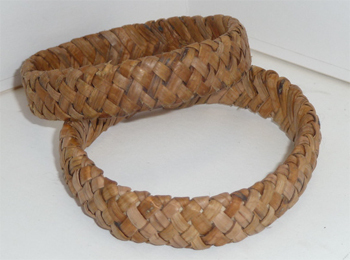 This 8-10” ribbed basket is woven with many gathered natural materials. Your frame, made from a piece of rhododendron branch, will be drilled and outfitted with the beginning ribs. You will choose from yellow cedar bark, flexible honeysuckle vines, elm bark, and seagrass for bands of weavers. 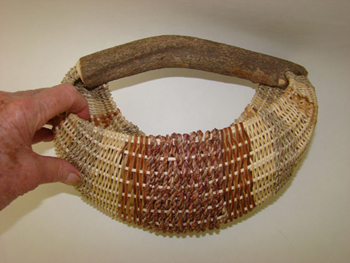 you will weave from each side and eventually meet in the middle to complete your basket. Gathering and preparation of materials will be discussed. 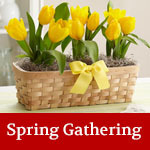 Depending on shape, your finished basket can be hung on a wall or be the center of attention on a table! Make your own one-of-a-kind pine needle work of art! Many cabochon stones/colors to pick from for the start. You will learn to coil with waxed linen, keeping the stitches neat and defined. Learn wrapping, adding beads, branching out, and adding a fagot lace stitch to open areas. Learn to transition and change colors of waxed linen. Several samples will be on hand to inspire you! FUN! No two will look the same. This is an upcycling project! 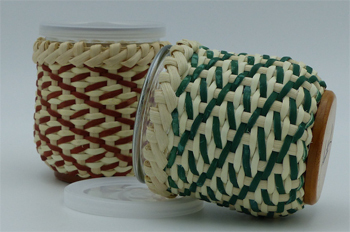 Learn this beautiful Japanese wave weave on a little jar saved from the recycle bin. 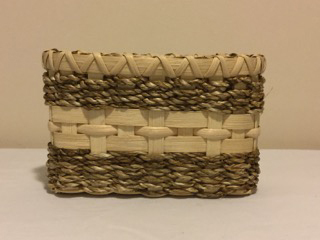 Basket is finished with a folded rim. 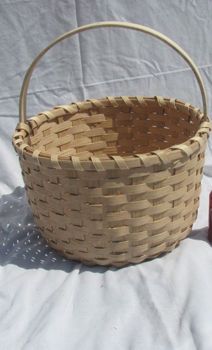 Class kits include the jar, a prefinished ash base, and a new plastic lid for your basket. Several color choices will be available. 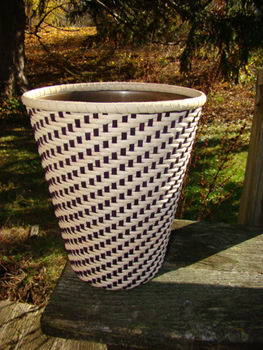 The colors of the woven birch will be your design as you attach it to a wooden base. You will embellish with pine needles and choose your stitching pattern where you will use waxed linen. You can make this petite version of my larger size “Tray of X’s.” Using various sizes of natural and dyed reed this square tray is accented making x’s as you weave. The sides have a graceful flare up to the rim which is lashed with waxed linen and includes leather handles. Tips on shaping and pattern repeats will be discussed. The French Bread is one of the newest baskets I teach. It is made from white oak trees I select, cut, and prepare by hand using homemade tools my dad made and used. It has a woven oak rectangular herringbone bottom and oval top. 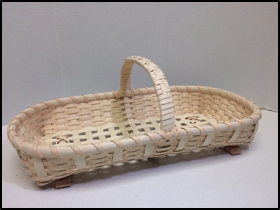 The basket will be woven on a mold and everyone should finish it in class. I will share all things concerning making a white oak tree into a beautiful basket. This sweet little basket is designed to hang on a doorknob so that you can surprise a special friend on May Day with a basket of flowers. 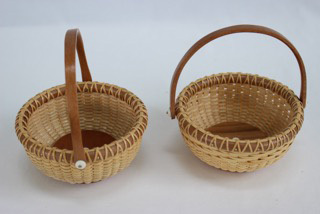 You will make one basket in class and go home with a kit to make another to keep. The graceful shape of the basket is achieved with freeform shaping. The basket is flat in the back to hug the door/wall and potbellied in the front. The ends of the Shaker tape are sewn for strength. 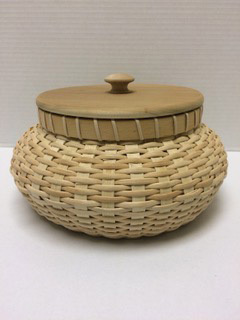 You can almost smell the balsam when you weave this basket! This miniature Adirondack back pack is woven with black ash spokes and cedar bark weavers. You will learn how to cut spokes to help produce the traditional shape. 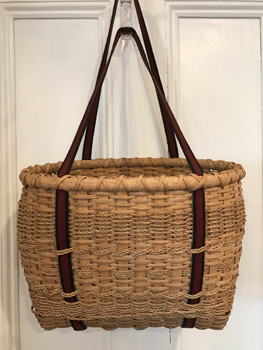 Your basket is completed with a black ash handle and lashing, elm bark rims, and pre-made leather straps with a metal buckle. Learn the joy of weaving with hand harvested and prepared Alaskan yellow cedar from Thorne Bay, Alaska! Everyone will finish one in class. Materials provided make two—some may finish both in class time, or take a kit home to reinforce what you have learned. 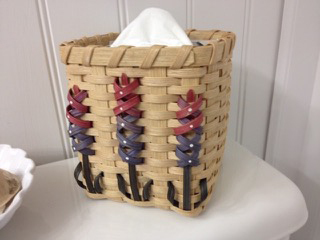 You will weave a cute little basket for your boutique tissue box with lupines on the front. Technique to add color without it bleeding onto your basket will taught. Lupines will be a solid color.